Ever travel to a brand new world? True story. It was my first trip to South America. I worked for a little company named Middleby, today a $3 billion-plus sales company that in 1986 was just over $38 million in annual sales. I don’t speak Spanish or Portuguese and would be relying on my Latin American export representative, Juan Cobo, to guide me through the market. Seriously. I was on my own. After claiming my luggage while a band of sleepy musicians played samba music for tips, I exited customs to a sea of people: family there to greet arriving relatives; cabbies hustling for rides; and panhandlers hoping for any handouts. I visited a currency exchange to trade my valuable American dollars for a rapidly devaluating Brazilian cruzado. I don’t remember her name, but she sweetly smiled and warned me in pidgin English, “hang on to your money.” I should have taken her advice to heart. After grabbing a cab to the Hotel Caesar Park, I checked in, dropped off my bags and set out to explore Rio. I had just left the lobby when I noticed a scrawny kid toss some dust on my Florsheim shoes. “Shine shoes, Senhor?” He asked. “Why not?” I replied kindly. He ran a grimy cloth across my shoe tops a few times and then asked me to pay him the equivalent of $50 USD. His little friends were gathering around. “I know my math,” I replied. I signaled what was a generous amount at the time, $5, and he nodded “yes.” I pulled out my money clip and the kid snatched it from the palm of my hand as fast as a viper strikes its prey. The kid went racing off down the street. What he couldn’t know was that I was a well-conditioned runner and he would be in for a long, dramatic race. I spent three days in Rio, fascinated how this breathtaking city of vistas has evolved from the center of power in South America for centuries to a tale of two cities today. The wealthy live in compounds near the beaches. But over one-million impoverished live in shanty town slums known as favelas, which have been ignored for decades except during election times. Instead, the favela hills have been ruled by drug lords since the 1950’s. 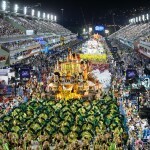 I was so drawn by this and two later trips, I wrote a musical called “RIO” about my experience. Am I better off staying with my prostitute mother who is hooked on crack cocaine or live on the streets? Will I earn more begging for scraps or stealing from tourists? Am I safer joining a drug gang for protection or running the risk of death-by-ambush from vigilante death squads or rival gangs? Am I really committing a sin if I murder to protect my own? 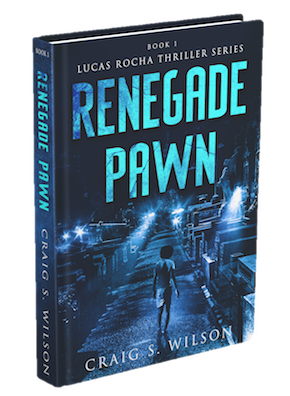 Renegade Pawn tells the story of sixteen-year-old Lucas Rocha, who watches helplessly as a death squad executes his older brother and he becomes the sole caregiver for his twin six year-old sisters. Should he beg, steal or sell drugs to survive? There is no right in a world of wrong. Sometimes good people do bad things for a greater good, even if it means joining a notorious drug gang.